KL Dragons Basketball Academy (MPL) agreed terms with 31-year old American power forward Bryan Davis (206-113kg-86, college: Texas A&M). He just played at Trouville in Uruguayan LUB league. In 10 games he had 11.6ppg, 8.6rpg, 1.8apg and 1.5spg this season. 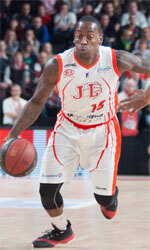 Davis also spent pre-season at CS Antonins (Pepsi LBL) in Lebanese league that year. He has tried to make it to the NBA and played in the NBA Pro Summer League in 2014. Davis played at the Arab Club Championships four years ago. He is quite experienced player. Davis' career allowed him to visit five different continents, while he played in twelve different countries. Davis tasted the life as pro basketball player in Europe, Asia, Latin America, Australia and of course North America. He has played previously professionally in Bahrain (Al-Muharraq), Belgium (Spirou Charleroi), China, Holland, Italy (Dinamica Mantova), New Zealand (Saints), Poland (Czarni), Puerto Rico (Capitanes), Taiwan (Dacin Tigers, Taiwan Beer and Kinmen Kaoliang Liquor), Ukraine, South Korea (SK Knights) and NBA G League (Reno Bighorns). Davis attended Texas A&M University until 2010 and it is his eighth season as a professional player. Hong Kong ELL upset SM Beermen in the opener. American-Dominican guard ODarien Bassett (189-86, college: Troy) nailed 29 points and 7 assists for the winning side and American guard Marcus Elliott (191-84, college: Louisiana Tech) accounted for 22 points, 8 rebounds and 5 assists. American-Puerto Rican forward Renaldo Balkman (203-84, college: S.Carolina) came up with a double-double by scoring 30 points, 13 rebounds and 7 assists and American-Puerto Rican center Peter Ramos (222-85) added 17 points, 7 rebounds and 4 assists respectively for SM Beermen in the defeat. Four SM Beermen players scored in double figures. CLS Knights outgunned Saigon Heat in the first game. 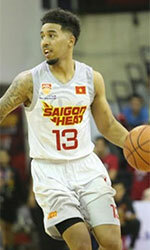 CLS Knights forced 23 Saigon Heat turnovers. Worth to mention a great performance of American guard Doug Herring-Jr (191-87, college: Utica) who helped to win the game recording a double-double by scoring 18 points, 5 rebounds and 10 assists. American-Nigerian power forward Maxie Esho (206-91, college: Massachusetts, agency: Two Points) contributed with 24 points and 6 rebounds for the winners. Four CLS Knights players scored in double figures. American center Kyle Barone (203-89, college: Idaho) answered with 12 points and 8 rebounds and the other American import forward Chris Dierker (196, college: Madonna) added 8 points and 9 rebounds in the effort for Saigon Heat. The winner was already known earlier in the game, so both coaches allowed to play the bench players saving starting five for next games. Mono Vampire upset Formosa to surge ahead in the series. Mono Vampire made 16-of-21 free shots (76.2 percent) during the game. They looked well-organized offensively handing out 22 assists. Great defensive blocking was one of the keys in this match when Mono Vampire made 10 blocks. American forward Michael Singletary (198-88, college: Texas Tech) stepped up with a double-double by scoring 23 points, 11 rebounds, 7 assists and 4 blocks for the winners and American-North Macedonian Romeo Travis (198-84, college: Akron) chipped in 19 points, 11 rebounds and 5 assists. Singletary is a former Eurobasket Summer League player, which is considered top international summer league in the market. At the losing side American forward Tevin Glass (206-94, college: ETSU) responded with a double-double by scoring 22 points and 12 rebounds and the other American import power forward Will Artino (211-92, college: Creighton) produced a double-double by scoring 21 points, 11 rebounds and 4 assists. Five Formosa D. players scored in double figures. Singapore Slingers defeated Macau to open win count. Singapore Slingers dominated down low during the game scoring 78 of its points in the paint compared to Macau's 58. They looked well-organized offensively handing out 22 assists. American guard Xavier Alexander (198-88, college: S.Nazarene) fired a double-double by scoring 25 points, 9 rebounds and 11 assists for the winners. His fellow American import power forward John Fields (205-88, college: Tennessee) chipped in 31 points. Four Singapore Slingers players scored in double figures. American power forward Ryan Watkins (206-91, college: Boise St., agency: Two Points) produced a double-double by scoring 30 points and 17 rebounds and American-Filipino guard Mikh McKinney (184-92, college: Sacramento St.) added 21 points and 9 assists respectively for lost side.